If you are suffering from the recent loss of a loved one, the upcoming holidays may no longer seem as festive. Buch Funeral Home wants to help you regain the hope of the holidays, by offering a special program to help you better understand and cope with grief and loss in the midst of the holiday season. This is a free program open to anyone who is dealing with the loss of a loved one. The event is led by Patti Anewalt, from Pathways Center for Grief & Loss, Hospice & Community Care. 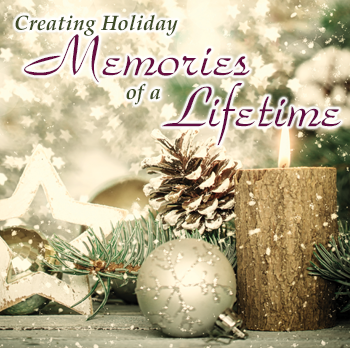 “Creating Holiday Memories of a Lifetime” will be held on Sunday, November 19, 2017 at 2:00pm at Enck’s Banquet & Conference Center. Reservations can be made by calling Aaron at 665-4341. The Creating Holiday Memories program is presented in a supportive and confidential environment and will include helpful ideas on ways to effectively cope. Presentations by Pathways Center and Buch funeral directors will share ideas that families can use to create their own memorials for loved ones. All participants of the program will receive resource materials on handling grief along with a special thank you gift. Refreshments will also be served.